A lot of people ask us; how do you clean leather? This guide will explain how to clean all items of leather. To clean leather you need to use Leather Ultra Clean. This is a very effective cleaner that deep cleans into the grain removing all dirt and grime from leather. Safe to use on all leather types except suede & nubuck, with outstanding results. When cleaning leather, it is always best to clean leather with a foam, rather than a liquid. Cleaning leather with foam is safer as it reduces the chances of bleach type marks and streaks, more importantly though, foam cleaning leather is a lot more effective than using liquids. Spray the Leather Ultra Clean onto a sponge and agitate it to create foam. Always spray the cleaner into a sponge and not directly onto the leather. A Foaming Bottle can be used to create foam for you. Rub the sponge into the leather in a circular motion to loosen the dirt. As the dirt is removed, the foam will absorb it stopping it from being transferred around the leather. Simply wipe the foam away with a cloth. Most leathers should clean very well with a sponge. However, if your leather is very dirty, light coloured and has dirt in the grain, you will find it much easier cleaning the leather with a Tampico Brush. You can see the area we cleaned in this photo using the Leather Ultra Clean and a sponge. After cleaning the next step is to protect & condition the leather. This photo shows an area where we have cleaned half of a seating cushion when we were cleaning a leather suite. This sofa was very dirty and hard to clean. So to make cleaning leather easier, we used the Tampico Brush to work the dirt out of the grain. 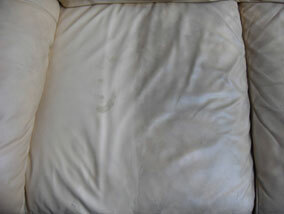 This photo shows an off white leather couch cushion with ingrained dirt and grime. The leather has been cleaned along the stitch lines to show the effectivness of the leather cleaner. You can also see that as leather gets dirty, it can become slightly shiny. Giving the leather a good clean removes the shine and the dirt. 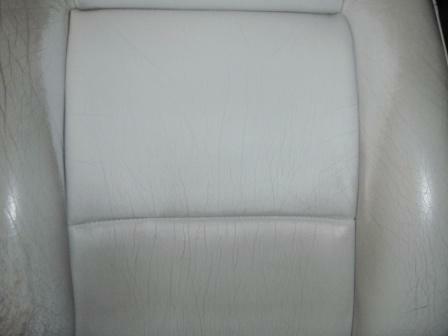 This ivory colour car seat has been cleaned in the top centre of the seat. Again, you can see that the dirty leather on the side bolsters is shiny. Giving the leather a thorough clean removes the dirt and removes the dirty shine. If leather your is naturally shiny the cleaner will not remove the shine, it will restore it to its natural state. It is an excellent car leather cleaner!